Whether you like to read about wine, beer and spirits or drink them, or both, here are a few ideas for your edification that might also make potentially interesting holiday gifts. One bourbon. 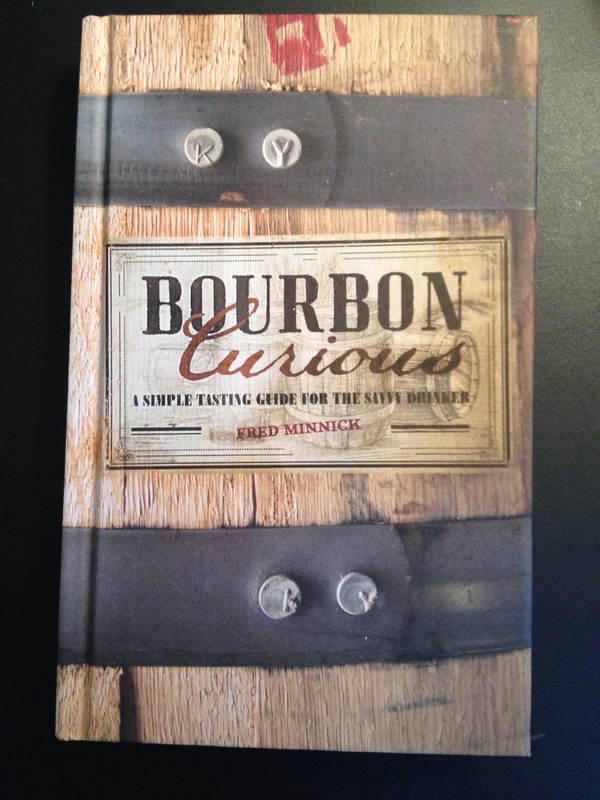 Book review: Bourbon Curious: A Simple Tasting Guide for the Savvy Drinker. If you are indeed curious about bourbon, this excellent book may help you become something of an expert. Written by a guy named Fred Minnick, noted whiskey authority who also wrote Whiskey Women: The Untold Story of How Women Saved Bourbon, Scotch and Irish Whiskey. The new book presents an easy-to-use interactive experience that helps you pick bourbons based on your flavor preferences. Using the same tasting principles he offers in his Kentucky Derby Museum classes and as a judge at the San Francisco World Spirits Competition, Minnick dismisses all the brand marketing hype and judges only the flavor of the bourbon. His guide starts by grouping bourbons into four main flavor profiles—grain, caramel, nutmeg, and cinnamon. Isn’t it cool to think of bourbon as having those surprising sweet/spice flavors? While many bourbons have all four of these flavor notes, one sensation usually overpowers the others. In the book you’ll learn about the predominant tastes of fifty different bourbon brands. Plus, you’ll find a bunch of cocktail recipes for making the most of the bourbons in each profile. The expert author debunks a lot of myths surrounding the drink and tells why these legends came to be. He explains the mysteries of making bourbon and reveals a few distillers’ secrets and even discloses some of their recipes for making this celebrated spirit. A great gift for a bourbon lover. One Scotch. Book review: Spirit of Place: Scotland’s Great Whisky Distilleries, by Charles MacLean. They say Scotch is an acquired taste. Certainly the peat-y, smoky taste and aroma of some varieties can take getting used to. But if you admire Scotland and its iconic Scotch whisky—no “e” please in Scotch whisky—or are planning to visit or have visited the distilleries, or just want to know more while you enjoy a drop at home, check out this recently released book. The book takes you on an annotated photographic tour of Scotland’s various distilleries–from Talisker to Lagavolin, Laphroaig to Dalwhinnie, the Isle of Arran to Glenkinchie. You’ll get a feel for the spirit of the place without having to hop an airplane. More than 250 specially commissioned photographs capture the beauty of the changing seasons in the landscapes around the distilleries, portray the skill and dedication of the craftsmen who work in them, and reveal the fine details of the buildings themselves. MacLean has authored 10 books including Malt Whisky and Scotch Whisky, both of which were shortlisted for Glenfiddich Awards, and Whisky: A Liquid History, which the James Beard Foundation named Wine and Spirit Book of the Year 2005. Lara Platman and Allan MacDonald, both professional photographers, took the beautiful photographs that give this book such a powerful feeling of place. It would make a lovely gift to yourself or your favorite Scotch lover. One beer. Birra Capri luxury Italian beer has just been picked up for distribution in Chicago. Known as “a wine drinker’s beer,” this unique brew—not many truly luxury Italian beers are available—is soft, light and refreshing, with very particular yeasts that give it a fruitful taste. It’s made to pair well a wide variety of cuisines. Made by the Brunetti brothers, Birra Capri was born in 2006 out of the family’s café in the heart of Anacapri. Birra Capri is unpasteurized and unfiltered, and is locally sourced and brewed in Capri, Italy. Recently was invited to sample a complementary dinner at one of the city’s newest Mexican restaurants, Ixcateco Grill, 3402 W. Montrose. It’s a very nice place to BYOB and enjoy some casual but sophisticated Mexican cuisine. We arrived a bit ahead of their 5 pm opening, but they let us sit on a ledge by the front window until they could seat us. Though we hadn’t requested it and it was not listed on the menu, our server apologized when he arrived at our table for not bringing us Chips and Salsa and promised he was on his way to get it then. Soon he returned with a basket of fresh, crunchy house-made tortilla chips with a small dish of their own really tasty green salsa (made with fresh tomatilloes). Excellent stuff. Ixcateco’s Chef Anselmo Ramirez learned by working closely with Rick Bayless and other well-known culinary artists before opening his own place in Albany Park, tucked-away on Chicago’s northwest side. But he also creates with the inner wisdom imparted by years of cooking with his grandmother. The unassuming storefront opens into a simple single room that’s painted in large swaths of bright color and hung with small Mexican art works. Spare but comfortable, except at our table the intense spot lighting was almost uncomfortably bright. The Piscaditos ($7) starter came as two corn pastry “boats” stuffed with pulled chicken and decorated with squiggles of avocado cream sauce. The pastry was tasty but fairly heavy, and we both left most of that on the plate. The roasted chicken was tender and juicy, and parts of it looked enhanced with a crunchy deep-fried crust. The meat was sparked with light spice from strips of pickled cactus. A rich and hearty appetizer. The Ensalada de Betabel ($7), a tender red-and-gold beet salad accented with crisp strips of jicama, studded with bits of goat cheese and sprinkled with tiny bites of toasted pecans, made a lovely counterpoint to the heavier appetizer. As for entrées, the Langostinos al Ajo ($17)—several cut-in-half-the-long way, wood-grilled, fall-apart-tender prawns in a salty, creamy garlic sauce—were served with a melange of avocado, tomato, onions and garlic chives that felt just right mixed into the mound of white rice. The Carnitas Asada ($16.50) was a generous slab of skirt steak marinated in an Adobo sauce, then beautifully grilled to a dark crusty exterior and a nicely chewy rare inside. It was served with a small scoop each of black beans and guacamole and a helping of tomato/garlic/serrano chile Molcajete sauce on the side. Desserts—also not listed on the menu—were few and simple when we asked the dining attendant. The Tres Leche cake was very light, sitting in a milky sauce and neatly capped with a layer of whipped topping. The flan was dark, roasted-tasting, thick and delicious with a thin layer of caramel on top. Ice cream was a third choice. The fact that this place is BYOB makes it especially attractive—no bottle charge. Every table filled as we ate, and each group brought its own libations. Service was attentive until the place got busy and our server seemed to forget us. We had to wait a noticeably long time to order desserts, and then had to again petition the dining attendant before we finally received them. The Chef says he will be regularly adding or adapting items on the limited menu to showcase the bounty of each season. Good, because judging by how busy it got on a Tuesday night, local residents are already thinking of this as a go-to dining choice; they’ll certainly want changing options on the menu. Although the location is far out-of-the-way for the average center-city dweller, folks in the neighborhood may find this a hidden gem. The Food Substitutions Bible, by David Joachim. Don’t have any XO sauce to make that cool Asian recipe? How about agave nectar for that delicious-sounding dessert? This book is full of practical ideas for coming up with things you have around the house that can take the place of both food ingredients and cooking materials and equipment. Don’t have a pastry bag? Try a plastic resealable bag or rolled parchment paper. Don’t have any dry mustard (sound familiar to you, too)? For 1 teaspoon of powdered, substitute 1 tablespoon prepared mustard minus 1 tsp liquid from the recipe. How about this surprise—if you don’t have coriander root (who does? ), for 1 tablespoon, substitute 2 tablespoons of thick cilantro stems! Whether you need a substitute for a key ingredient or utensil, want to vary the flavor or texture of a recipe or even just figure out a healthier version of an old favorite, this book has some great ideas for improvising with confidence. The first edition of this book won the prestigious International Association of Culinary Professionals (IACP) award. Now Joachim, author, editor and collaborator on more than 30 cookbooks, includes 50 new recipes in this revised edition. Just reading the pages—all information is clearly laid out in neat, easy-to-read boxes—may inspire you to new culinary efforts. Fun to read. The Field Guide to Bitters & Amari, by Mark Bitterman. This book addresses the mysterious substances known as bitters. The book contains photos of some of the 500 different bitters it lists, along with flavor profiles and tasting notes for each—it’s a genuine field guide (p 137). You’ll learn that bitters come in categories: aromatic, citrus, fruit, spice, spicy, herbal-floral, and nut. In addition to the extensive information on bitters, the book also talks about 50 different amari, the popular after-dinner digestif drinks considered the kindred spirits of bitters because they’re based on roots and herbs, and gives instructions on how to build a well-balanced cocktail with an amaro (p 87). Plus the book contains dozens of recipes for sophisticated drinks and cool food items like Bittered Fried Chicken and Fried Olive-stuffed Olives with Bitter Lemon Olive Oil-Parsley dipping sauce. How about a Bittersweet Chocolate Torte that uses black walnut bitters in the cake and spiced bitters in the glaze? Aren’t you just ready to run out and buy a dozen bottles of bitters right now? The author clearly knows whereof he speaks—he actually runs a store called The Meadow that sells the largest selection of bitters in the world at all three of its locations. He even gives instructions in the book on how to make bitters and amari at home. The book comes with a heavy, rich-looking, leather-like cover with orange/gold debossed printing and would make a wonderful gift for any food and/or drink aficionado looking for some excitement. The Spice & Herb Bible, by Ian Hemphill with recipes by Kate Hemphill. What is the difference between a spice and an herb? How did people use spices in 1700 BCE? How about a recipe for Chocolate and Wattleseed Truffle (p. 674) to crown your dinner party? Think about making Indian Butter Chicken (p. 156)—with a homemade 11-spice blend and chicken breasts marinated in a yogurt curry accented with tomato paste, brown sugar, almonds, tomato chutney, grated onion, garlic and more spices. Num. This revised edition is a heavy, massive paperback book with glossy photos and lots of white space, boxed information, easy-to-read lists, and good ideas for how to buy and store, along with creative uses and recipes for everything from allspice to zedoary (white turmeric). Be aware that all recipe ingredients are given in milliliters and grams rather than ounces—an opportunity to polish up your knowledge of converting to and from the metric system. This book is great for a wannabe chef or someone who just wants to spread her wings and try new things in the kitchen. 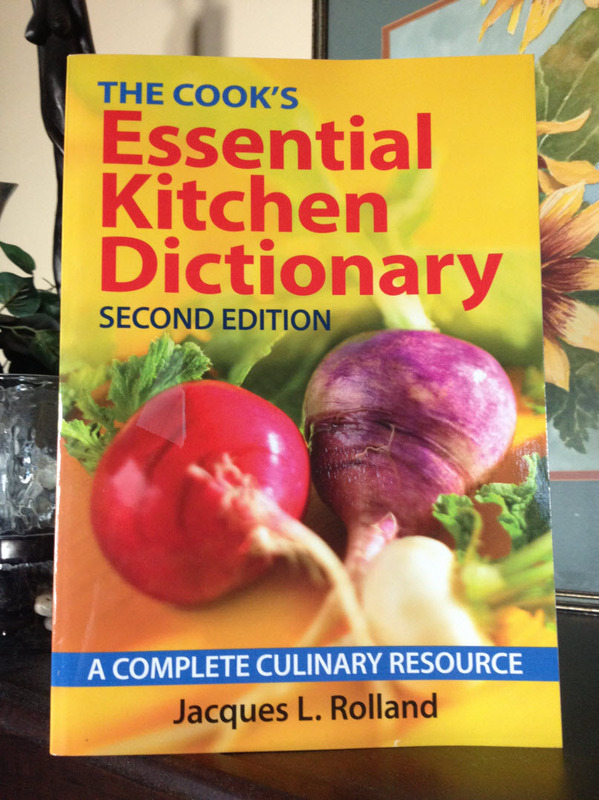 The Cook’s Essential Kitchen Dictionary, by Jacques L. Rolland. Sure, we can look up anything we want online. And that’s great, but there’s really no substitute for a book when you want to explore something at your leisure. Here you’ll find food history, anecdotes, and information about origins and cultures along with 5000 definitions for familiar and not-so-familiar food and ingredient terms like distillation empanada, jicama, kohlrabi leavening, nam pia, orgeat, ratatouille sake, zabaglione and more. Use this for practical assistance when making a recipe with strange ingredients, or just read it for the joy of learning more about the amazing things people eat and season their food with. The author of this book is a Frenchman with a degree in culinary arts and hotel management and also a certified sommelier (a very tough exam to pass). In this book (he also wrote The Food Encyclopedia) he shares his extensive knowledge of current realities of the world’s culinary landscape and intersperses it with his experiences teaching classes in etiquette, service and wine. Eat Mediterranean for health, longevity and FLAVOR! 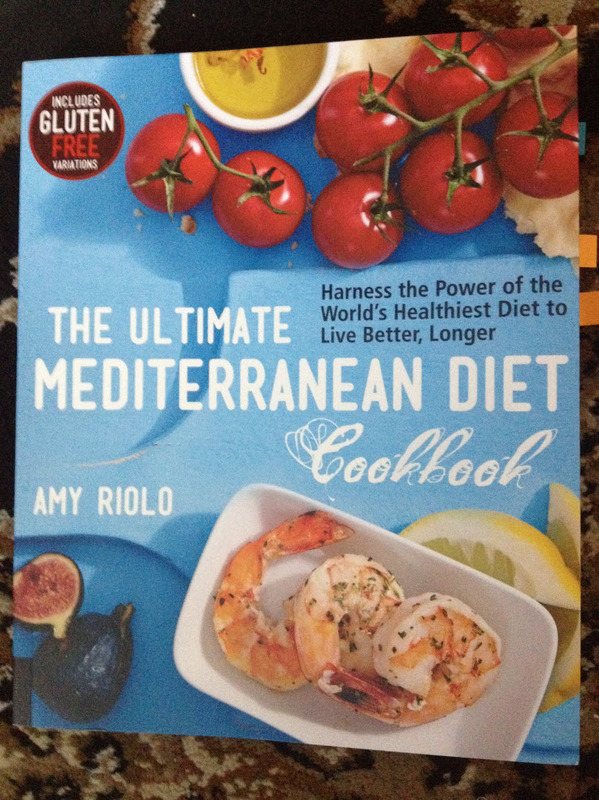 The Ultimate Mediterranean Diet Cookbook, by Amy Riolo, chef, television personality, cuisine and culture expert, is an Italian American of Calabrian descent. The focus here is on the health benefits—living longer and better—of the delicious dishes that characterize the Mediterranean diet—said to lower your chance of developing heart disease by nearly 50%. Author Riolo talks about what you should eat and why, as well as when you should eat it. You’ll find, for example, a thorough explanation of how and why vegetables are part of the foundation of Mediterranean eating (often the basis for entire meals) just before recipes for asparagus soup, spaghetti squash “pasta,” and a Moroccon Vegetable Tajine. Read a write-up on the nutritional benefits of fish and seafood, just before recipes like Greek-style Roasted Fish and Vegetables, and a boxed tip explaining that marinating seafood, meat or chicken before grilling it doesn’t just taste great. It also “reduces the harmful cancer-causing substances” that open-flame cooking can produce. Riolo groups meats with sweets in the book because, as she says, both are rich in fat and eaten quite sparingly in the typical Mediterranean diet. The book contains 100 recipes from 25 different countries around the Mediterranean Sea. Riolo is also the author of The Mediterranean Diabetes Cookbook, Nile Style: Egyptian Cuisine and Culture, Recipes & Princely Entertaining Ideas from the Arabian Peninsula, and several others. Discover the joys of pairing beer with cookies! 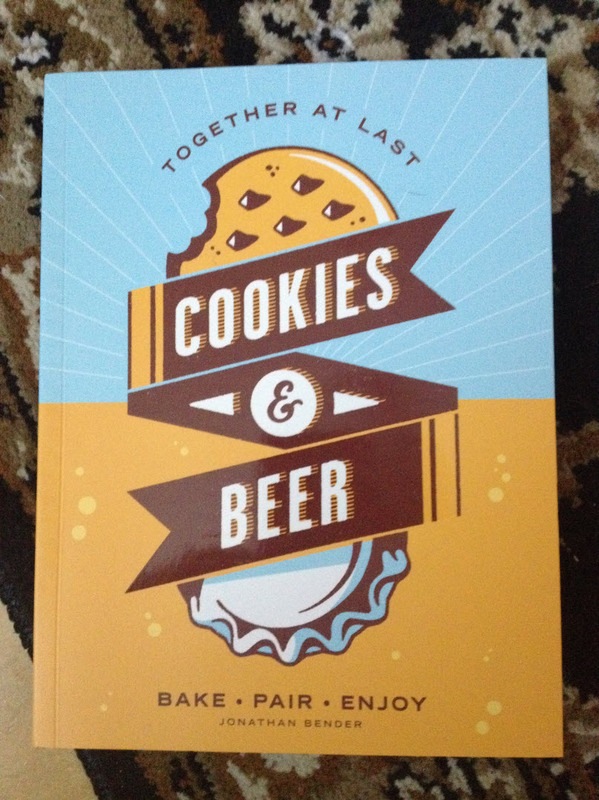 Cookies & Beer: Bake, Pair, Enjoy, by Jonathan Bender. Yes, you read it right: Cookies and beer. While this may seem like heresy, the more you read about it, the more sense it makes. Both things have important ingredients in common: grains, spices and fruits. The book points out how the perfect beer can bring out unexpected flavors in a cookie, and how the right cookie can awaken flavors hardly noticed before in a beer. You can tell this guy’s a food writer. This book is fun to read and dream about—even if you never make any of the recipes. If you haven’t heard of this group and you love dogs–and wine–you’re in for a surprise. Chateau La Paws (CLP) supports no-kill shelters all over the U.S. and to support its work, sells some very good wines from the folks at Diageo Chateau & Estate Wines (DC&E). Even more fun, they put pictures of their still-need-a-forever-home dogs on all the wine labels! And just recently CLP announced the release of four new Sonoma varietals (Cabernet Sauvignon, Merlot, Sweet Red Blend and Sauvignon Blanc). Now available nationwide, the new bottles feature 28 additional North Shore Animal League America (NSALA) rescue dogs. 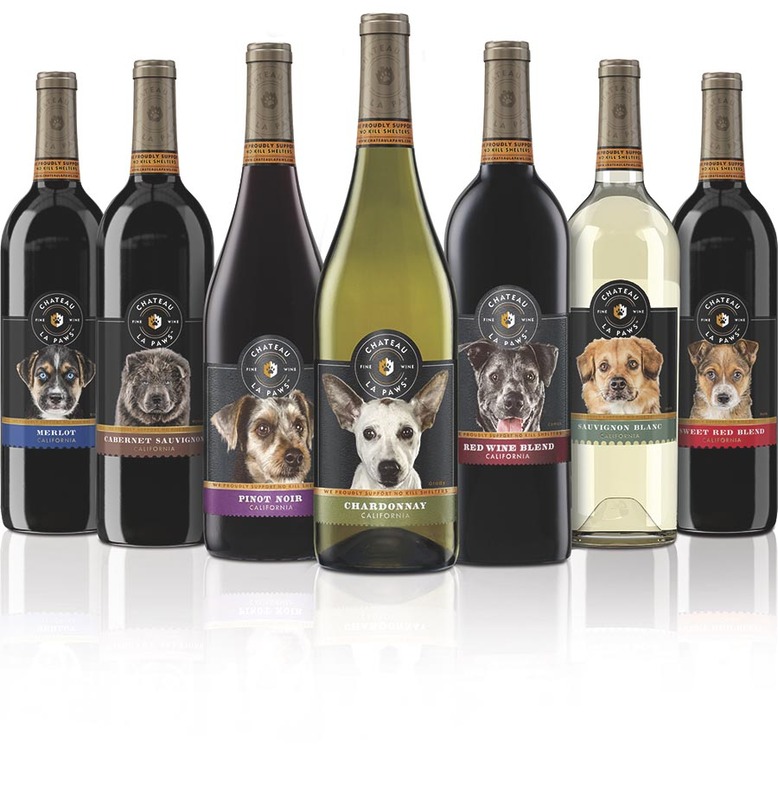 The new offerings join Chateau La Paws Chardonnay, Red Blend and Pinot Noir, launched earlier this year. I was sent a sample and can say their new Cabernet Sauvignon was light but still complex enough to go well with almost any food. At the checkout of my local Binny’s the other day I was surprised when the young lady remarked that she liked my headband with paws all over it. 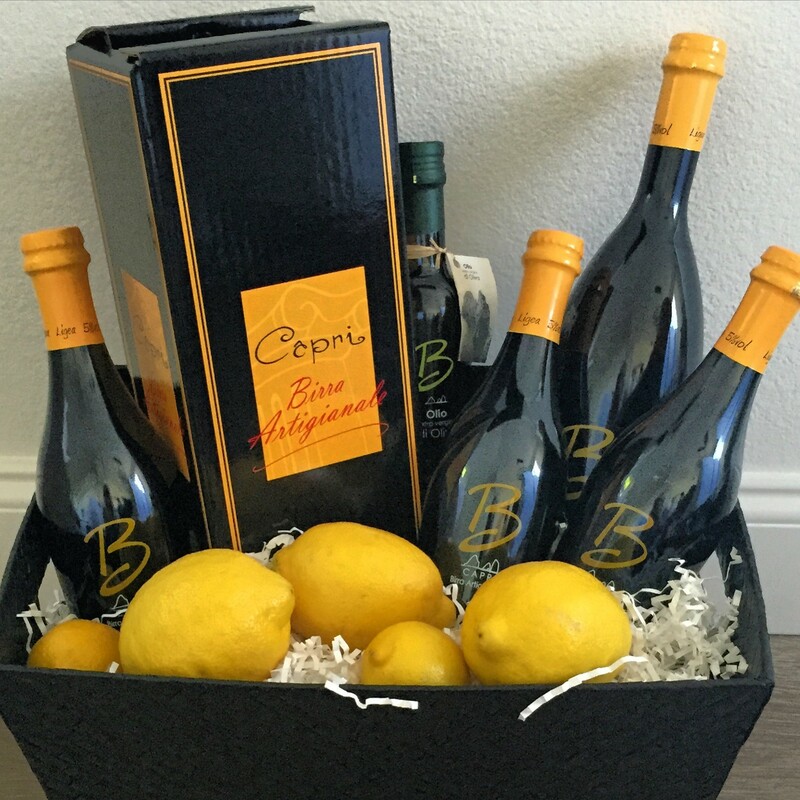 I laughed and told her it was from Chateau La Paws and she said, oh, yes, I always buy wines from them as gifts to bring to friends’ houses for dinner–a regular CLP customer. Both CLP’s Chardonnay and its Red Blend received Gold medals at the 2015 Los Angeles International Wine Competition with the latter, in fact, receiving the honor of “Best in Class.” Impressive. Along with well-respected wines, the official national partnership with NSALA helps shelter dogs find a chateau of their own. Chateau La Paws encourages wine lovers to always support rescue adoption. Chicago loves French cooking, and during the week of November 9-19, a bunch of French restaurants are inviting Chicagoans to sample the French table with prix-fixe menus for $33 or $44. Like Restaurant Week, this festival, called a la carte Chicago, gives you a chance to try a restaurant’s offerings at a reduced price—a great way to expand your culinary horizons. Chicago French restaurants and associations teamed up to create this festival of menus, tastings and events around town. It will showcase the best efforts of chefs, bakers and wine-and-spirits experts all over the city. Check here for more information and a complete list of participating restaurants and other venues. A la carte Chicago also gives you chances to go behind the scenes. Hone your culinary skills with cooking workshops—say, how a French chef does hamburger! Follow a French Chef throughout the day and experience the life of a master at work. Discover new cookbooks at special events. Indulge in an Oscar-winning French film. Share a lunch with the Consul General of France. Partners include: Bistronomic, Chez Moi, Shaw’s Crab House, Sofitel Chicago Water Tower, Kendall College, French Pastry School, Viktorija Todorovska, Sommelier and Author of Provence Food and Wine: The Art of Living, Consulat General de France a Chicago, French-American Chamber of Commerce Chicago, Alliance Francaise de Chicago, Business France, Kendall College, and Watel / Davis.